Page revised in February 2017. The locations covered in this section were visited in January 2012. Melita (Malta) was located at the centre of the Roman Empire, however, because it was too far away from the coasts of Sicily and Africa, the island was not a port of call along the main trade routes between Rome and its provinces. The Roman municipium (main town) of Malta was located in the south-western part of the island on a hill at a certain distance from the sea and which had a commanding view. This position allowed the inhabitants of the town to avoid being caught by surprise by raids of pirates. Archaeologists have been able to identify the extent of the Roman town which was larger than today's Mdina. In 1881 the remains of a Roman villa were identified near the Greeks' Gate of the town and in 1920-24 the area was carefully excavated and some elaborate mosaics were found. The villa is dated late Ist century AD and it shows that its inhabitants were wealthy enough to pay for mosaic makers from Sicily or Tunisia to travel to Malta and to decorate the building with subjects typical of the Hellenistic tradition. 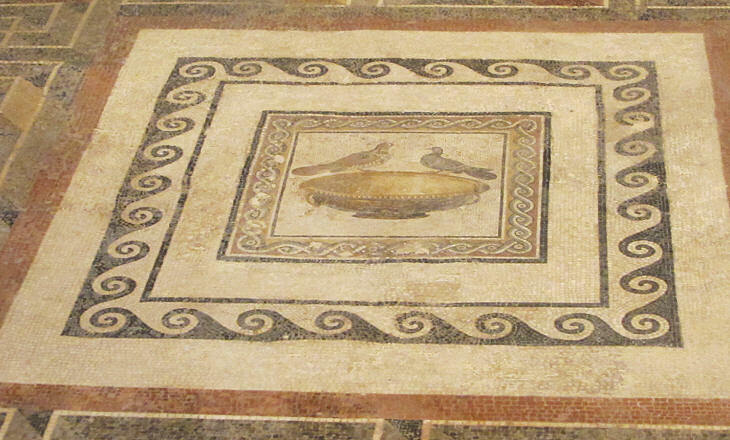 The theme of drinking doves appears in many other ancient mosaics where it is often depicted in conjunction with the Three Graces (see a mosaic at Narlikuyu in Turkey), but it eventually became a Christian symbol (see a mosaic at S. Costanza in Rome). The motif of the frame is known as Vitruvian scroll, because it was described in De Architectura, a famous treaty on architecture written by Vitruvius. 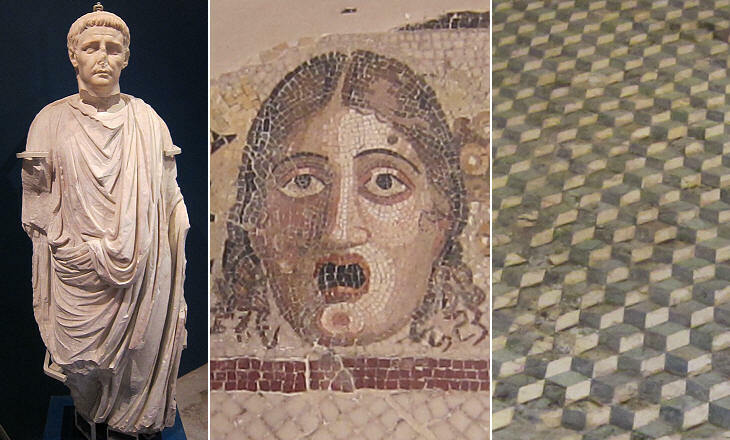 Examples of this motif can be seen in many mosaics at Antioch. In the Vth century Malta was conquered by the Vandals and in the following one by the Byzantines. Its population greatly declined and when the Arabs from Tunisia landed on the island they almost found no evidence of a structured society, although the island housed a small Byzantine fleet. Roman Melita was too large to be effectively protected and the Arabs chose to dig a ditch and build walls around its eastern section which was located on higher ground. They called it Medina which means walled town. 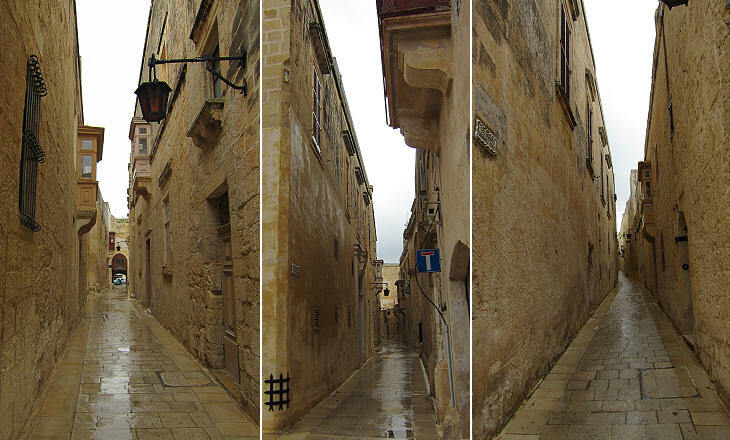 Mdina has undergone many changes through the centuries, also because of an earthquake in 1693. The Norman/Aragonese buildings near Greeks' Gate were less affected by the reconstruction effort which followed the earthquake and they retain a somewhat Arab appearance with high walls and few windows ensuring the privacy of the houses. At the end of the XIth century the Normans landed on Malta and the local Arab governor acknowledged the suzerainty of Roger, King of Sicily. Mdina which was eventually renamed Città Notabile remained the capital of the island, although the Normans and after them the Aragonese developed Borgo, a small settlement near the great natural harbour on the eastern coast of the island. Malta became a county of Sicily and some of the local wealthiest families were given noble titles. 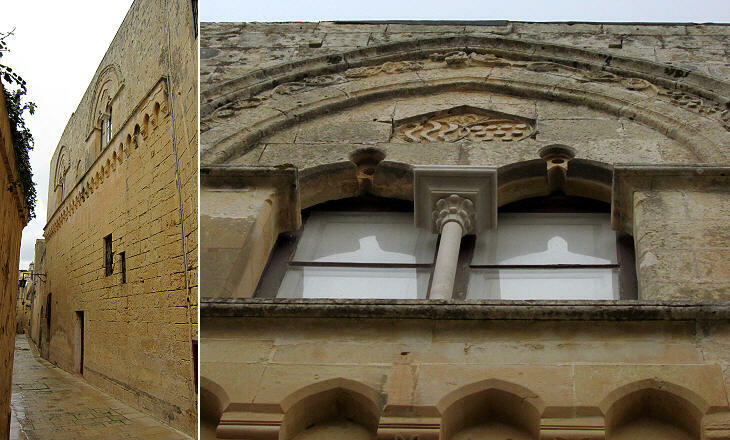 They built large houses in a style which is typical of Sicily and which combines Gothic and Islamic art features. In 1530 Emperor Charles V assigned the County of Malta to the Knights Hospitallers (or of St. John or of Rhodes). 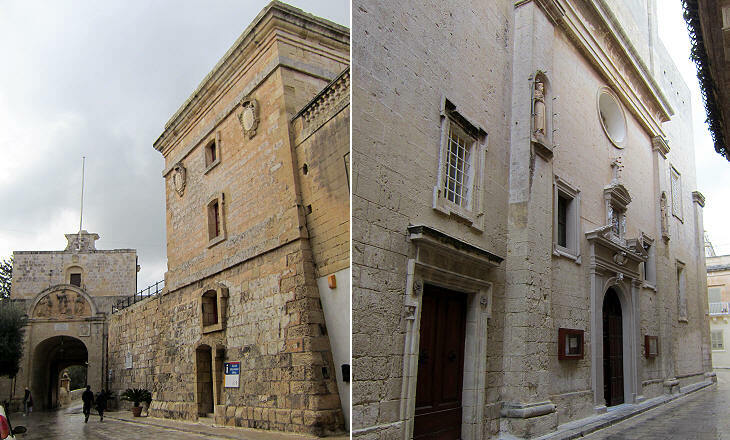 Once in Malta the Knights set their residence at Borgo and they eventually moved to Valletta, a new town founded by Grand Master Valette in 1566. 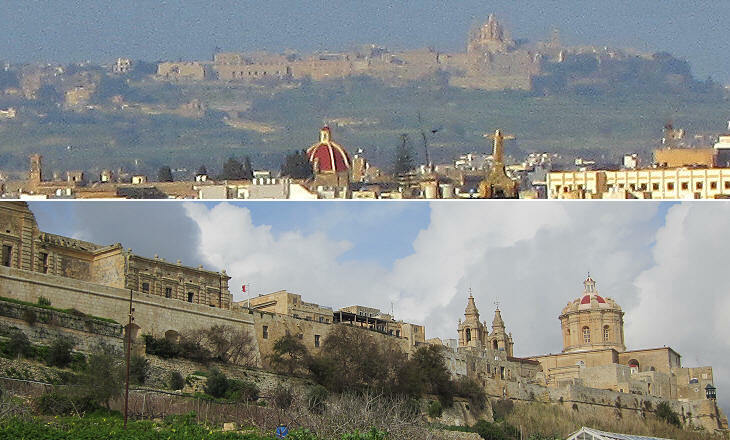 Mdina however remained the religious capital of the island and the Bishops of Malta continued to reside there. 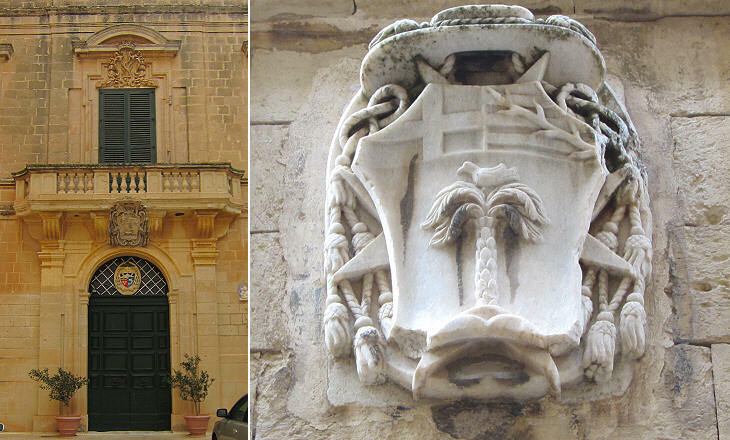 Although in Malta it is not unusual to see the coat of arms of a bishop combined with that of the reigning Grand Master, conflicts between religious and civilian authorities were rather frequent and in some cases the popes themselves had to intervene to solve them. The Grand Masters strengthened the fortifications of Mdina and during the 1565 Great Siege of Malta a handful of Knights and local soldiers were able to repel an Ottoman attempt to seize the town. A tower was built in the XVIIth century from which signals could be made to the other fortresses on the island. The earthquake of 1693 damaged many buildings including St. Paul's, the cathedral. Grand Master Vilhena promoted a major redesign of the area between the main gate and the cathedral; the chapel of St. Peter's is one of the few monuments which was not modified. The image used as background for this page shows a decorative motif at Falson Palace, a much restored lookalike Norman building.